As we have seen, the available evidence does not support the idea that Jesus’ original followers subscribed to a miraculous physical resurrection. It suggests instead that their beliefs centred on the promises Jesus had made about returning from heaven as ‘the Son of Man’ to establish God’s Kingdom on Earth, which they would then rule with him. Elements of this promise survive in the gospels as we have them, even if there are, in all four, obvious concessions to Paul’s Christ figure; the gospels were, after all, written after Paul’s version of Christianity had begun to take hold. Significantly, the promise of the triumphant appearance of the Son of Man ‘within this generation’ is present in Q, the source of many of the sayings common to both Matthew and Luke’s gospels that they didn’t get from Mark. It’s also there in the sources (L and M) peculiar to each of the gospels. 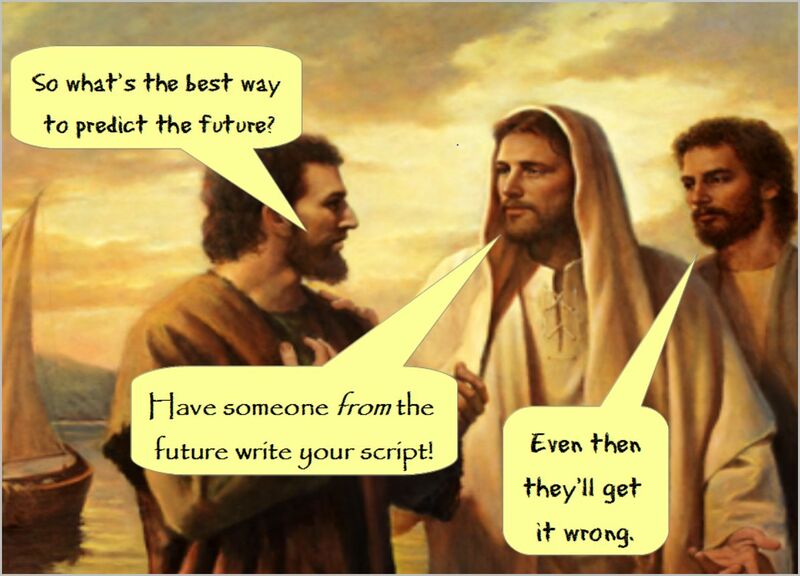 Obviously L, M and Q pre-date the gospels that later made use of them. Scholars think Q could have been written as early as 40CE, a few years after Jesus’ death, with some sayings earlier than that. It pre-dates Paul too and reflects a tradition that has nothing to do with him or his convoluted theology. Q, in fact, has no sayings attributed to the resurrected Jesus, nor anything from his trial, the crucifixion or resurrection.1 How can that be? Were they not important to the early believers who compiled it? The answer can only be, no, they weren’t. For the creators of Q what mattered was what Jesus said – his ethical teaching and his promise to return as the Son of Man, within his hearers’ lifetime, to inaugurate the Kingdom of God on Earth in which the disciples would reign alongside him (Matthew 19:28). To be part of this Kingdom, people had to become righteous, not have it gifted to them (Matthew 5.20 & 48). This was the ‘good news’ for Jesus’ earliest followers, the gospel as it is preserved in the Q source.2 The lie that the disciples were to rule the world with Jesus inspired them to spread the news of the coming Kingdom; they demonstrate little interest in a reanimated dead man or a magical salvation formula. So, did the disciples die for their faith in the Risen Jesus? Highly unlikely. They don’t seem, despite the later stories in which they feature, to attach any importance, at least in Q, to visions of a resurrected god-man. How did they die, then? The simple answer is that, for most of them, we don’t know. 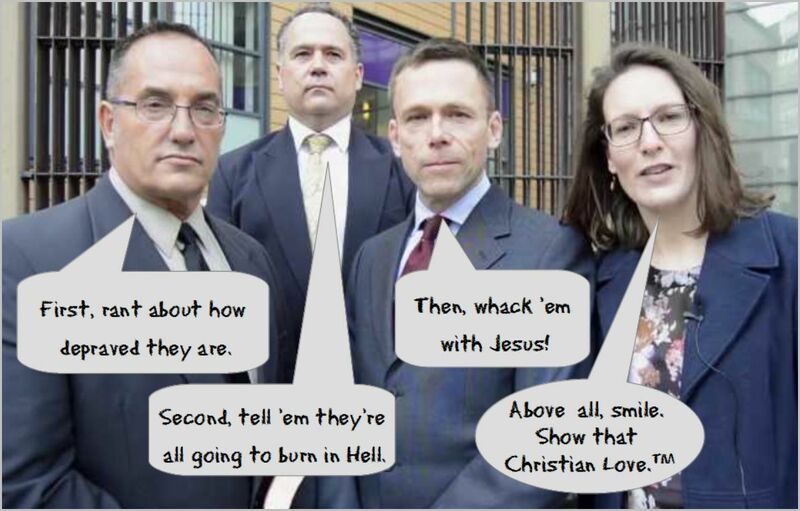 They could have met their end when the original church community in Jerusalem was annihilated by the Romans in 70CE. The Romans didn’t particularly care what a minority group of fanatics believed – they were rebellious Jews who needed to be taught a lesson. If not slaughtered by Romans in their capture of Jerusalem, then perhaps the disciples died for their seditious belief in the imminent arrival of the Kingdom of God, just as Jesus had before them. The Bible records the deaths of only two of them: Judas, who appears to have committed suicide using two different methods depending on which account you believe (Matthew 27:5-8 or Acts 1:18-19), and James, brother of John, who, according to Acts 12.1-2 was executed by Herod Agrippa 1. By the time Acts was written, however, somewhere between 80-90CE, the beliefs of the original followers had been swallowed up by Paul’s alternate version of the faith; we have no way of knowing how accurate the report of James’ death is. It’s hard to believe it was merely because he thought an old pal had risen from the dead. It is hard to believe this of any of them. For the other disciples there are only traditional accounts of how they died ‘for their faith’ with nothing to corroborate these legends. It is quite possible Jesus’ original followers died for reasons unconnected with their outlandish beliefs in an imminent supernatural kingdom. They could just as easily have died of natural causes. One thing seems probable – they did not die because they believed in a resurrected Messiah. It’s not that they didn’t believe in a physical resurrection – they did – but they were convinced it would only happen with the arrival of God’s Kingdom on Earth, as prophesied in Daniel 12.1-4. That it had already happened to their former leader did not figure in their beliefs, their writing or even their thinking. Updated to include link to Matthew Ferguson’s celsus blog. The disciples would not have died for a lie, or so Christians like to argue. Fanatics today do and it is more than likely the disciples believed their lie was true, if indeed they died for it at all. There’s not much evidence that they did. But if they did, maybe the lie they believed to be true was not the one today’s Christians think it was. There is no evidence anywhere that Jesus’ original followers were martyred because of their faith in a physically resurrected Jesus – for their beliefs, maybe, but not necessarily because they believed Jesus had returned in bodily form from the dead. On the contrary, the evidence suggests that they holed up in Jerusalem to await his return through the clouds as the Son of Man, with a phalanx of hostile angels by his side (Heaven was, after all, just on the other side of those clouds). This was the crux of their beliefs. There was significant tension between the disciples and Paul, which Paul himself relates, not only because he was convinced his message should be taken to the Gentiles but because of the very nature of that message. Paul and the disciples meant different things by ‘the gospel’. Paul’s irritation that others were preaching a different gospel is apparent in 2 Corinthians 11 & 12 where he calls the original disciples, ‘false apostles, deceitful workers, disguising themselves as apostles of Christ’ and bitterly refers to them as ‘the most eminent apostles’. He is arrogant enough to suppose, and to proclaim, that he has it right and they are wrong. Paul’s good news was about the resurrected Christ of his visions, who magically made those who put their faith in him righteous in God’s eyes. As he puts it in 2 Corinthians 5:21, ‘God made him who had no sin to be sin for us, so that in him we might become the righteousness of God.’ Paul also believed this supernatural being would soon descend from the skies when he would give believers new bodies (Philippians 3.20) but this is a very different figure, and agenda, from the Jesus known to the disciples. What then of Paul’s insistence, in 1 Corinthians 15.5 (written circa 55CE), that ‘the Twelve’ experienced the Risen Christ in much the same way he did? Firstly, of course, we have only Paul’s word for this. We have no first-hand corroboration (just the opposite in fact) and Paul had a vested interest in showing how significant his own experiences were. What better way to do so than by claiming Jesus’ original followers had had the same sort of hallucinations? Secondly, we don’t know what these ‘visions’, if they had them, meant to the disciples. Their belief would undoubtedly have been in a physical, bodily resurrection (cf: Daniel 2.12; Matthew 27.52), not in the beam-of-light manifestation of hallucination; this was much more Paul’s thing. 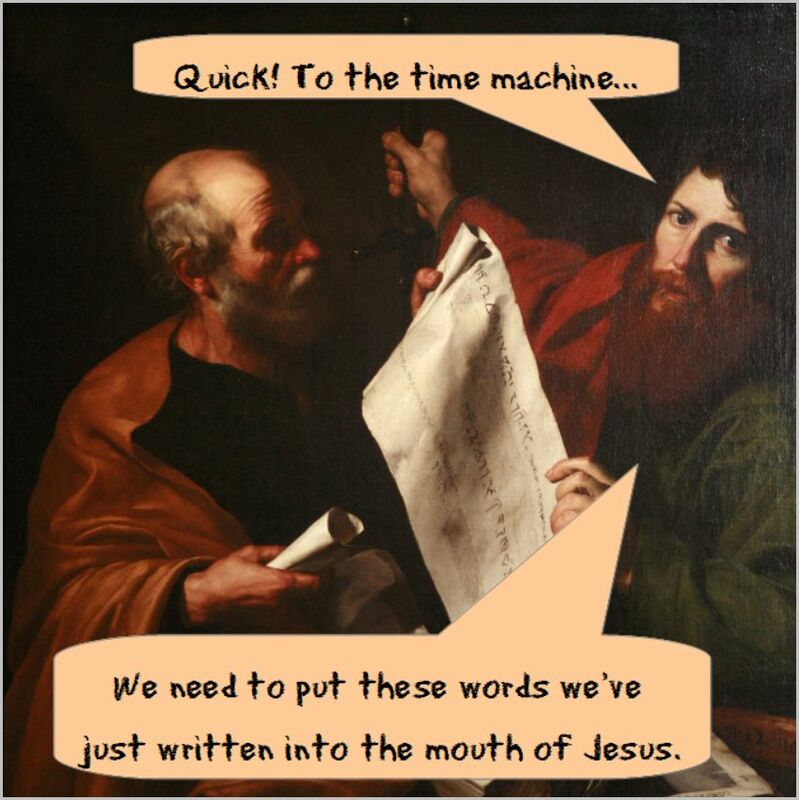 Perhaps this is why any words uttered by vision-Jesus (for surely he would have spoken to his old chums) were not considered significant enough to be included in the earliest written record, ‘Q’. The fully-realised resurrection appearances found in the gospels, then, in which Jesus declaims ‘blessed are they that have not seen, and yet have believed’ and ‘go and make disciples of all nations,’ are very clearly later developments, based, not on Q but on the visions suffered by Paul and others of influence and ‘written back’ into the gospel accounts. Despite claiming that the Twelve experienced the Risen Christ in much the same way he did, Paul is critical of the disciples for preaching a different gospel, a different Jesus even, from the magical salvation-formula gospel he expounds. So what did the disciples believe – what was this other gospel that Paul disparaged so much? As David Madison points out, Paul happily admits he invented this – or, rather, he worked it up from one of his hallucinations. He certainly didn’t hear it from the people who’d known Jesus when he was alive; it’s unlikely they would have subscribed to such barbarity. As Madison shows, the idea of consuming blood, even symbolically, would have been anathema to most Jews (Deuteronomy 12.23 etc); it’s a ritual that originates in pagan worship. It’s there, for example, in Mithraism, which flourished in, among other places, Tarsus, where Paul came from. Evidently, celebrating Christ’s sacrifice by eating his body and drinking his blood took hold in the churches Paul established and by the time the gospels came to be written, its origin story was sent back in time to be part of them. This kind of thing happens in comic books all the time. It’s quite possible that the stories of the resurrection developed the same way. We know that later followers of Jesus had visions that they interpreted as being of ‘Christ’. We know this because Paul refers to his experience a few times and also implies that other people had visions similar to his own. Were these hallucinations the only ‘sightings’ of the Risen Christ? We have no first-hand, eye-witness accounts of any other sort. Given that bodies don’t ever rise from the grave, especially not after a couple of days, it is more than likely they were all imaginary. It looks suspiciously like later encounters of Christ – all entirely within people’s heads – were written back into the gospel accounts to become the resurrection. Some of these were ‘firmed up’ to seem like encounters with a real person, which led to the invention of the empty-tomb, while others weren’t; a number make little attempt to convey an encounter with a real flesh-and-blood individual. Bur wait, you say. There were believers in the resurrection before Paul. Surely the original followers of Jesus – the disciples, Mary Magdalene – saw the Risen Jesus. That’s why they believed in him, why they gave their lives to his cause, why they were prepared to die for their faith. Their community was wiped out by the Romans in 70CE. Their brand of the faith, whatever it was, was obliterated by Paul’s Christ cult. They had plenty of other reasons for believing in Jesus. Seemingly Jesus told them he’d be back soon, bringing God’s Kingdom with him (Matthew 16.27-28 etc). And then, as he promised, the meek would inherit the Earth and his original followers would the rule the planet with him (Matt 19.28). Good enough – though completely daft reasons – why, after his death, these same followers holed-up in Jerusalem to await his re-appearance (through the clouds no less). The unlikely resurrection scenario, if they were even aware of it outside of their difficult meetings with Paul, must have seemed a poor second to the possibility of ruling the world in the here and now alongside their returned Lord and Master. So, it’s entirely plausible that the resurrection, like Jesus’ prophecy of the temple’s destruction and the body-and-blood ritual of the Last Supper were invented decades after he lived by those in the Christ cult. It has long been known that the experiences of those in the early church, particularly those promoted by Paul, were written back into the gospels when they came to be created years after Jesus’ and the disciples’ deaths. Much of what you read there is fiction, propaganda served up, and believed to this day, as history. How much of the Bible was written backwards? We know for a fact the book of Daniel was. The term for creating a prophecy after the event it purportedly predicts is Vaticinium ex eventu (Latin for ‘devious sleight of hand’). The creators of the Book of Daniel in the Old Testament were rather fond of Vaticinium ex eventu. Daniel’s prophecies, supposedly written in the sixth century BCE during the Babylonian exile about events that would occur later – much later – were actually created during the second century BCE. This was, of course, after most of them had occurred, which is how Daniel manages to predict most of them with reasonable accuracy. The remaining prophecy, however, written before the events it purportedly predicts is hopeless, completely way off; it foresees the resurrection of God’s people and the establishment of his Kingdom on Earth in the early part of the first century. As we know, this didn’t happen, though Daniel’s madcap ideas influenced the creators of the Jesus cult who all thought they were living in the end times. Jesus’ term for himself, ‘Son of Man’, is lifted straight from Daniel. This is how most prophecy in the Bible works; it’s either written after the event, Vaticinium ex eventu style, or, when it’s genuinely written beforehand, doesn’t – surprise, surprise – ever come to pass. Which bring us to Jesus own predictions of the destruction of the Jewish Temple in Jerusalem. He explains to his disciples in some detail in Mark 13 what to expect. He suggests too that soon after the destruction, the Son of Man will arrive through the clouds to establish God’s Kingdom on Earth, once and for all (well, maybe not all – just for ‘righteous’ Jews). It is no coincidence that Mark’s gospel was written about 70CE, just after the temple was destroyed, which makes it easy for Jesus to outline in some detail what the event would like, describing, as he is, what it was like. Did I say Jesus? No, not Jesus, but the anonymous author of ‘Mark’s’ gospel who implants his knowledge from 70CE back to 30CE and on to Jesus. He – the gospel writer – also has Jesus refer to the opposition some believers were experiencing in the 70s and to the ‘reader’ of his warning. As David Madison notes in Ten Tough Problems in Christian Thought and Belief , ‘reader’ is an anachronism too; Jesus had no ‘readers’ when he was alive. The whole prophecy is later fabrication. Its author is typically less successful – completely unsuccessful in fact – in his prediction that soon after the events he describes, the Son of Man would return to put everything right (Mark 13.26-27). So, as we might expect, there is a reasonable degree of accuracy from the bit of the ‘prophecy’ written after the event, but none at all when it genuinely looks to the future. But it’s not just prophecy this affects. It looks very much that key episodes in the Jesus story were invented (long) after his death, assuming he existed in the first place, and were added into the gospel stories many more years later. John’s gospel is almost entirely like this. The Jesus of the fourth gospel bears no relation to that in the synoptic gospels; in John he has morphed into the Christ of late first-century Christian belief, spouting fantastical gibberish about himself, like ‘I am the Way, the Truth and the Life’ and ‘I and the Father are One’. The Christ of faith is superimposed on the itinerant Jewish peasant executed for sedition. It happens in the synoptic gospels too. In Matthew 28.19, the post-mortem Jesus commands his followers to ‘Go therefore and make disciples of all the nations, baptising them in the name of the Father and the Son and the Holy Spirit,’ undoubtedly quoting a later liturgical formula; the notion of the Trinity explicitly referenced here was unknown in Jesus’ own time and indeed in Paul’s. Similarly, the disputes with the scribes and Pharisees represent the writing back into the gospels of later Christians’ difficulties with the religious hierarchy.1 Jesus’ Sermon on the Mount meanwhile is demonstrably a later creation, not translated from Aramaic but written in Greek.2 Other absolutely crucial aspects of the Jesus story – it is easy to see how a case can be made for his not having existed at all – are also retrospective additions. We will come to them next time. 1 ‘Perhaps the best way to explain Matthew’s extensive criticism of the Jewish authorities is to say that his own community continued to experience opposition from non-Christian Jews, especially influential scribes and rabbis of the local synagogue(s), who accused them of abandoning Moses and the Law, of becoming apostate from the Jewish religion through their ill-advised faith in Jesus.’ Bart D. Ehrman, chapter 6, The New Testament: A Historical Introduction to the Early Christian Writings.